It was a day for quinellas, first time wins and hard-earnt victories at HOY. Emily Hayward, aboard Yandoo Lady Gold, was a very popular winner in the Bayleys Real Estate Young Rider of the Year. It looked like Werner Deeg’s course was going to be simply too challenging . . . that was until 18-year-old Hayward rode in on her Australian import. She was second to last in the 28-strong field and rode a stunning round to post the only clear in the opener. The judges called back 13 combinations who notched eight faults or less in the first round. Clears were a little more prevalent in the second, with Kimberley Bird and Cera Cassina continuing their solid HOY, Steffi Whittaker and Ngahiwi Cruise, Nakeysha Lammers and her homebred Resolution and of course, Hayward who completed the class with a clean slate. It was her fourth crack at the Young Rider, but for the past three years she has won the Aspiring Rider crown at HOY. Her victory today was very special. Hayward had prepared for the challenging two round competition with extra attention to Blondie’s fitness and says it paid off. Hayward thanked the many who had supported her this season, and was particularly grateful to her family. Blondie has been her rock this season, and done well throughout. The horse is on the market, but Hayward said she may rethink that after today’s result. Bird finished second with her combined tally of four faults from the two rounds, with Lammers third, also on four, Nicola Hammond aboard Carl I fourth, Whittaker fifth and Blake Davis on Giggles sixth. New Zealand Performance Horses dominated the Five-Year-Old of the Year class, finishing first, second and fifth. NZPH rider Alex Loiselle took the class aboard Dakota NZPH (by Pezetas du Rouet out of Oki Doki NZPH), who now head to Australia on Monday to join Birdy Berry (nee Hansen). She has long had her eye on the talented horse and finally managed to convince dad Warwick to let her cross the Tasman. Loiselle was second on Dallas NZPH (by Quintus out of United Blue NZPH), with Amy Roydhouse, Downtown NZPH (by Quool de Bois Margot out of Truly Blue) coming in for fifth. NZPH co-owner Warwick Hansen was both pleased and proud to see his horses do well at the show, not just in the age group classes, but also in plenty of others. Loiselle said the title class as HOY was one that had been circled on his calendar for a long time, and he was rapt with the efforts of his young charges. It came down to a two horse jump-off in the Seven-Year-Old of the Year class between Tegan Fitzsimon aboard Windermere Cappuccino (by Corofino II out of Vespa) and Robert Steele on Delta Blue (by Littorio out of Blue Bird). The two were the only ones in the 38-strong field to leave all the rails in place and meet a rather testing time allowed. Fitzsimon was first out and knew there was no chance of going for an easy clear with long-time campaigner Steele to follow. She threw down the gauntlet, coming home clear in 49.29 seconds. Steele came out firing and while he was a fraction faster with his 48.63 second effort, he paid for it with a rail near the end of the course. The combination, who have been together since he was four, won the Five-Year-Old of the Year title and were fourth in the Six-Year-Old of the Year. This season has been another solid effort, with wins in all his series starts. 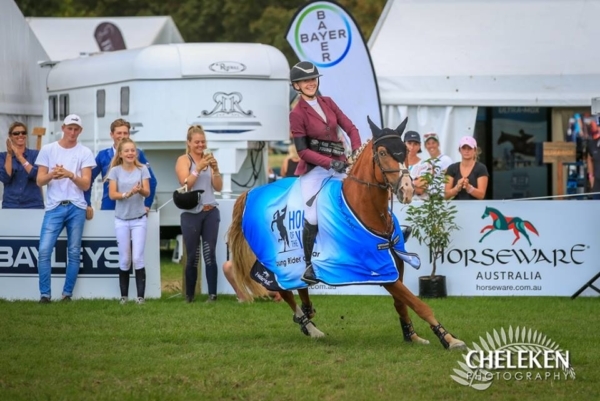 Bayleys Real Estate Young Rider of the Year as part of the FMG Young Rider Series: Emily Hayward, Yandoo Lady Gold 1, Kimberley Bird, Cera Cassina 2, Nakeysha Lammers, Resolution 3, Nicola Hammond, Carol I 4, Steffi Whittaker, Ngahiwi Cruise 5, Blake Davis, Giggles 6. Seven-Year-Old of the Year as part of the Purepine Shavings Seven Year Old Series: Tegan Fitzsimon, Winderemere Cappuccino (by Corofino II out of Vespa) 1, Robert Steele, Delta Blue (by Littorio out of Blue Bird) 2, Alex Loiselle, Bandito NZPH 3, Lucy Fell, Faratona STS (by Appleton DHU out of Arabella) 4, Clarke Johnstone, Dolly Blue (by Diarado out of Chance for Ever) 5, Catherine Cameron, Kingslea Couture (by Lansing out of Kiwi Courage) 6. Five-Year-Old of the Year as part of the East Coast Performance Horses Five Year Old Series: Alex Loiselle, Dakota NZPH (by Pezetas du Rouet out of Oki Doki NZPH) 1, Alex Loiselle, Dallas NZPH (by Quintus out of United Blue NZPH) 2, Georgia Percy, Double J Image (by Repicharge) 3, Courtney Townsend, Adele (by Andretti out of Miss Victoria) 4, Amy Roydhouse, Downtown NZPH (by Quool de Bois Margot out of Truly Blue) 5, Melody Matheson, Enya MH (by Edward out of Grandessa MH) 6.